Get a working Capital Paypal loan that can skyrock your business earnings (online or offline). PayPal launched a Working Capital pilot program in 2013 before opening up to all users in 2014. The lending service is intended to make it easier for small business owners to get hold of capital to grow their businesses. If you sell online, chances are you use PayPal, at least as a backup payment method. In practice,the loans resemble merchant cash advances, though they are technically loans, not a sale of future receivables. When you get a loan, you are charged a one-time flat fee; to pay off the loan and the fee, repayments are made through a daily deduction of a percentage of your sales. There is a lot to like about the Working Capital: the application process is generally fast and easy, the loans offer a lot of flexibility, and the fees better than or comparable to those of similar lenders. APRs go up to 25%, and you can expect to repay between $1.005 and $1.35 for every dollar borrowed. 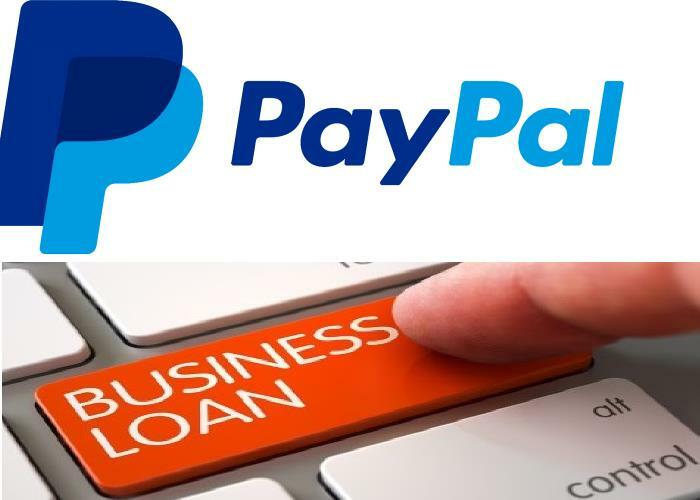 PayPal offers short term business loans. Other: Must have a Premier or Business PayPal account for at least 3 months. It does not require a minimum credit score, nor do they require you to be in business for a certain amount of time. However, you do need to have a Premier or Business account that’s at least three months old. 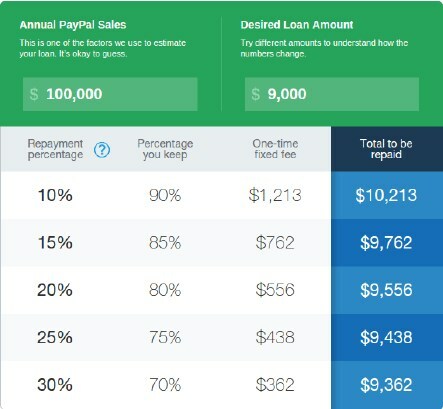 According to the website, you can get a loan of maximum of 18% of your annual sales, with a cap at $97K. For example, if you make $100K annually, you get a maximum of $9K loan. Working Capital loans are repaid through a daily deduction of a percentage of your sales. You don’t have a set maturity date; PayPal just keeps making daily deductions until the loan is paid in full. That said, they do appear to cap term lengths at a maximum of 18 months, or 540 days. The only fee charges is a one-time fee, calculated once based on the principal. They do not charge interest, so your fee does not change regardless of how long you take to repay the loan. Based on the calculator on the website, you can get somewhere between 1.005 – 1.35 times the amount of capital you’re borrowing. In other words, you’ll pay somewhere between $1.01 and $1.35 for every $1.00 you borrow. Higher fees are directly inverse to the withholding percentage. The less PayPal is allowed to deduct from your account each day, the higher your fee is going to be. By contrast, the more PayPal is allowed to deduct, the lower your fee. Here’s an example from the payments calculator on the website, so you can see how the withholding rate corresponds to the fee. Obviously, you should try it out yourself using numbers more pertinent to your business. It appears that the calculator was designed so APRs go as high as 25%. That said, your APR will vary depending upon how much you borrow, your fee, your withholding rate, and your repayment length. For more information on how APRs apply to loans with fixed fees, check out this article. To recoup the money for your loan, a certain percentage of your sales will be deducted every day. (somewhere between 10% and 30% of your daily sales). Although Working Capital loans don’t have a set maturity date, There are some markers to ensure that you’re up to date on your loan. Every 90 days you have to pay at least 10% of your loan and the fee. Using the above example, if you have to repay $9,556 total, every 90 days you have to pay at least $956. For most customers, this will happen automatically via daily deductions. Should you fall behind, the remainder will become due at the 90 day mark. All you have to do to apply is to fill out an application accessed via your account. The application involves verifying your identity, place of business, and some financial information. PayPal doesn’t need a whole lot of information, given that they’re your credit card processor and subsequently might just know more about your financial situation than you do. When you’ve completed the application, you’ll know if you’ve been approved or denied. If you’re approved, you’ll have the opportunity to choose a fee and withholding rate. The working capital will be deposited into your account instantly. On PayPal’s end, you might be denied because it was unable to verify some of your information or some other technical error. If you can see no reason for denial, your best course of action is to wait until the next day and try again. If you’re re-applying for an additional loan, wait at least three days for PayPal to process that your previous loan has been paid off. There is a remarkably detailed section of their website dedicated to this service. You should have a very clear idea of how the loan works before applying. The only thing I wish they’d provide more information about is rejection criteria. Merchants who have been denied often have no idea why. PayPal does provide an explanation, but oftentimes it’s too vague to be of any real use. You can reach PayPal via phone (4am – 10pm Monday – Friday; 6am – 8pm Saturday – Sunday PST) or email. The company also has an active presence on social media sites, including a Twitter account dedicated to customer assistance. Unfortunately, as many large companies do, there is inconsistent customer service. Working Capital customers are especially susceptible to unhelpful customer service because the loan approval process is completely automated. If you run into problems, customer service doesn’t have a whole lot of helping power. Even so, if you’re having problems getting approved, it’s still worth it to call up customer service; they might have more insight regarding what you’re doing wrong than you do. There is a very large and very helpful community forum. Any problems you run into have likely been encountered by somebody else, so it’s worth checking out if you’re experiencing difficulties. complaints regarding the Working Capital service. That said, as we’ve talked about on our review of PayPal Here, they are extremely professional and courteous when responding to and resolving complaints. Small Borrowing Maximum: The maximum offer is 18% of your annual sales, up to $85K. Since many businesses only use PayPal as a secondary source of payments, that number might be a very small amount of their total income. Technical Errors: Merchants have reported technical errors or denials for no reason, even if they had previously been loaned money to their business. While still a minor problem, these complaints have slowed down since I last checked in on this service. No Early Repayment Incentive: Because there is a one-time fixed fee charges , you cannot save money by repaying early. The only reason to repay early is to get another loan. Fast Application Process: The application process only takes minutes. Easy Access to Cash: PayPal is the master at fast cash transfers. ACH takes a few days, but Paypal is almost instantaneous. One-Time Fee: No accruing interest? Sounds like a good deal. Inexpensive Fee/low APRs: For a short term loan, PayPal has some good fees. Flexible fee structure: The fee structure gives the borrower some control over the deal. Hands-off repayment method: Just make sure the money’s in the account. PayPal does the rest. good for any business that would benefit from a small infusion of capital. Merchants that like the looks might also want to investigate the possibility of obtaining a line of credit. Like this service, lines of credit are intended for a small infusion of cash. Unlike this service, you don’t have to pay off your previous loan and reapply every time you want more money. APRs apply to loans with fixed fees. "A man there was, and they called him mad, The more he gave, the more he had"
6 Best Free bitcoin donation widget for blogger and WordPress. 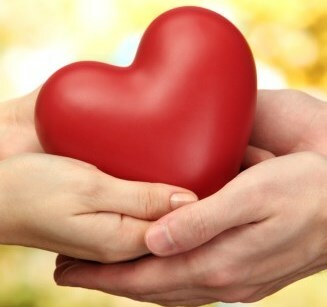 Donation Humanity: Get a working Capital Paypal loan that can skyrock your business earnings (online or offline).